A pair of Japanese bronze vases depicting scenes with different birds. These would make a wonderful pair of lamps. These vases would make excellent lamps. 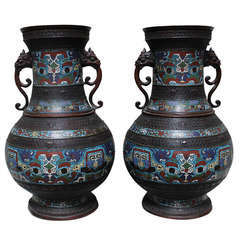 A pair of large 19th century, Japanese champlevé vases with Chinese design. A pair of French 19th century bronze candelabra with animal motif. 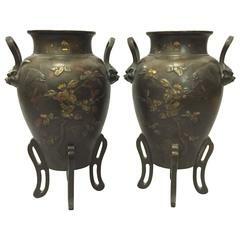 Pair of Japanese vases 19th century bronze enamel Cloisonne flower decor Meiji period. Measure: H 30 cm. Pair of Japanese vases 19th century bronze with flamingo decor Meiji period. Pair of Japanese 19th century bronze vases with a flamingo on each side Meiji period Measures: H 27 cm. 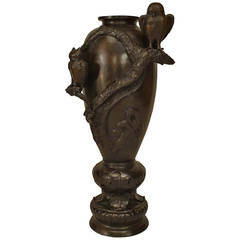 Japanese floor vase composed of bronze cast with arboreal and avian low and high reliefs, such as owls perched on branches, above a tiered round base. 19th century Japanese bronze champleve enamel vase Meiji Period,measures: H 31 cm, Antik.